Although the labor market started the year at a healthy pace, it has since lost significant momentum, and is now limping into the summer months, much like last year. With global influences siphoning strength from the U.S. economy, prospects of a steady recovery have begun to fade. Numerous countries across Europe have already entered a second recession and the eurozone unemployment rate has reached an all-time high. At the same time, China’s economic growth rate has begun to slow. This combination of events, together with austerity measures in much of Europe, will weigh on international trade and handicap U.S. multi-national companies. With the deluge of troubling information in recent weeks, employers have once again become increasingly cautious and begun to tighten their hiring efforts. Employers added just 69,000 jobs last month, the weakest monthly total recorded since May last year. 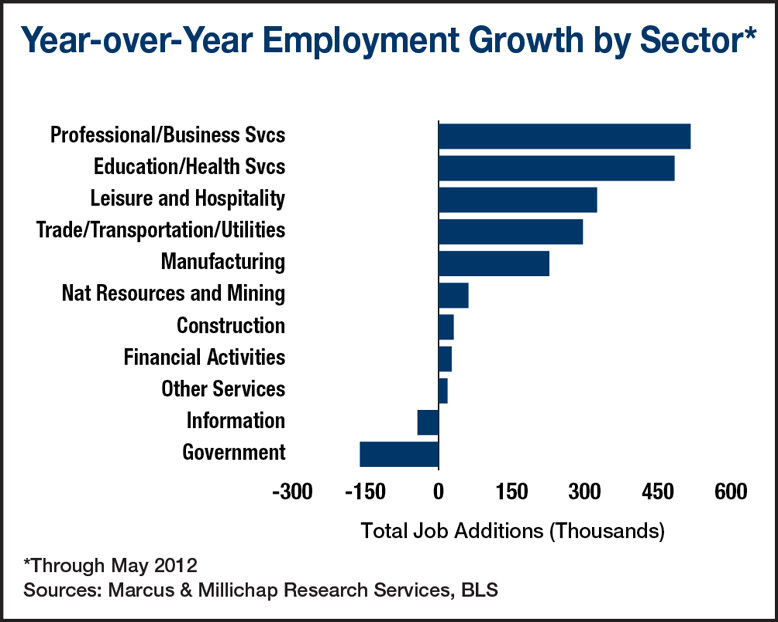 In addition, revisions slashed 49,000 positions from the March and April job totals. Despite the relatively weak headline figures, portions of the employment market maintained momentum. Six of 10 private-employment sectors added workers during the month, led by freight haulers and utilities which hired 35,600 employees, contributing to a gain of 54,000 jobs in the trade, transportation and utilities sector. Medical practices also expanded in May, creating 34,000 positions as healthcare benefits became available to workers who have re-entered the work force over the last year. Four private-employment sectors shed a combined 40,000 positions last month, however, led by a loss of 28,000 construction jobs. Shrinking construction payrolls appear at odds with recent increases in construction spending and rising residential permit issuance. In response to softer consumer demand, businesses are scaling back inventory levels. While a reduction in inventories is a drag on GDP, it also can provide fuel for a recovery. When spending begins to gain momentum, businesses will have to crank up production, rather than pull from existing stockpiles of goods to meet the new demand. The industrial sector will be the primary commercial real estate sector to benefit from increased production. The rise in employment, earnings and hours served to bolster consumer confidence, which clearly catalyzed retail sales performance. Sales receipts for department stores strengthened due to new strategies that included downsized formats, renovations, selective closings and repositioning. Property sector fundamentals exhibited improvement nationally as well. Net absorption totaled 60 million square feet in 2011, nearly double the record-low 35 million square feet completed. The overall vacancy rate declined 30 basis points to 9.7 percent. Nationally, asking and effective rents averaged for all retail types remained unchanged, stemming 12 consecutive monthly declines in effective rents. Projections call for a further decline in vacancy to 9.2 percent by year end. Strength in consumer spending, trade and the manufacturing sectors benefits industrial properties as rising capacity utilization rates and inventory rebuilding stimulate warehouse demand. The nearly 97 million square feet of industrial space absorbed in 2011 represents a 500 percent increase over 2010. Risks of a spike in oil prices and eurozone weakness heighten the prospect of weaker trade volumes, which would attenuate demand and slow expansion. However, vacancy could tighten by 90 basis points to 11.0 percent by year end if the economy continues to expand as forecast. The Research Brief blog from Marcus & Millichap offers timely insight and expertise into the rapidly changing investment real estate industry. The Research Brief is published weekly by top industry professionals, showcasing time-sensitive information and valuable analysis. Add the Research Brief blog to your reading list today. The information contained herein was obtained from sources deemed reliable. Every effort was made to obtain complete and accurate information; however, no representation, warranty or guarantee to the accuracy, express or implied, is made. This entry was written by marcusmillichap, posted on June 6, 2012 at 12:21 am, filed under Research. Bookmark the permalink. Follow any comments here with the RSS feed for this post. Trackbacks are closed, but you can post a comment.